Located on the Amazon Island where is a part of Terme, district of Samsun, famous Amazon Village is an artificial settlement founded by Samsun Metropolitan Municipality. This artificial village reflects the ancient time; especially the story of, life style of Amazon Women also called as Tupi is represented here. Thus this area laying a bridge between past and future provides the visitors to observe the prehistoric times and History of Amazons who are the fearless, powerful women warriors. Today, covering the area of 850.000 m2, this wonderful land cost 2.000.000 Turkish Lira. 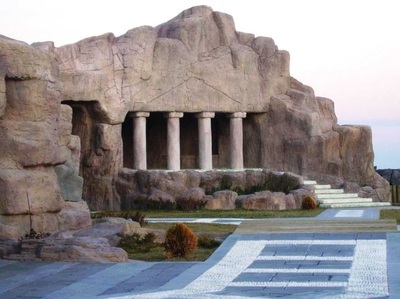 It includes 25 unique waxworks built by famous Turk sculptor Adil Çelik, tents illustrating the daily life, caves, prisons, weapons, water channels, an awesome park full of life-sized cartoon characters like pink panther and Anatolian Lions Statues. In addition to that, there is a cable car (telfer) lying down Amisos Hill from Batıpark which provides the visitors to witness unbelievable, enchanting landscape. This amazing cable car is 323 long and it also causes the people make a fascinating journey to the Amazon Life which leaves them breathless. Glorious, symbol of Amazon female warriors and their courage, one of the very valuable masterpieces in Samsun, Amazon Sculpture meets the visitors within the entry section of Amazon Island. 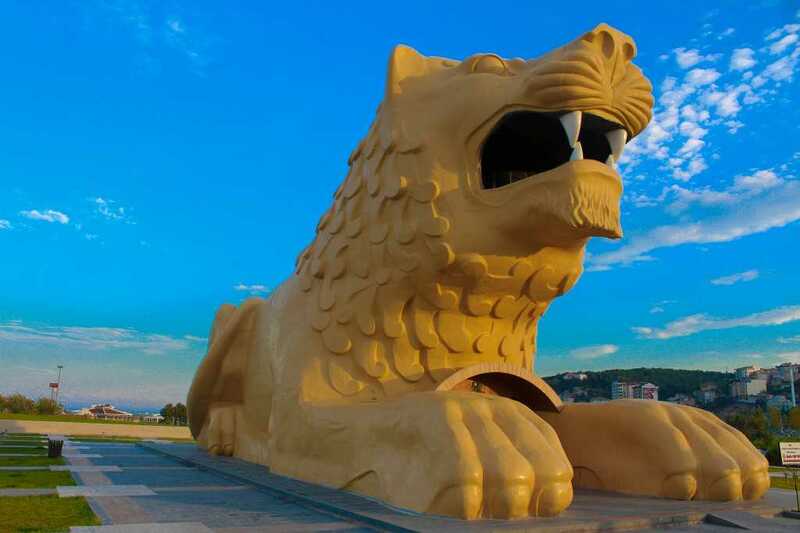 This enormous artwork is erected by Samsun Metropolitan Municipality and it is 12,5 m in height, 4 m in width and 6 tone in weight. Built by 10 different sculptors who are specialists in their field, this piece, pearl of Amazon Village was completed in 5 months. 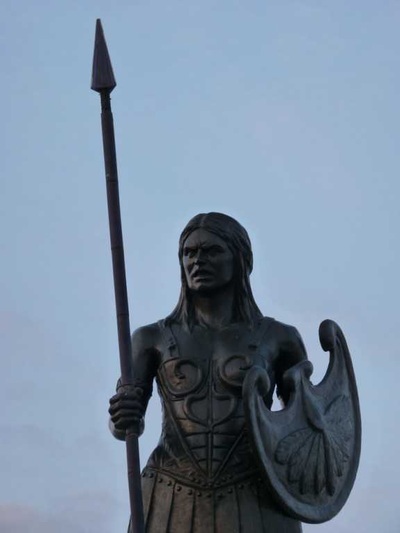 This gigantic statue consists of three parts like female warrior, her shield and lance. There are found two kinds of lion statues on the right and left sides of Samsun Batıpark. They are approximately 24 m in length, 11 m height and 8 m in width. They have a special thick, wooden door ornamented with traditional motives. Actually, by using these doors, the visitors can easily arrive at the mouth of the lions showing the village and at the stomach of them reflecting 3 d war scenes of Amazon women. 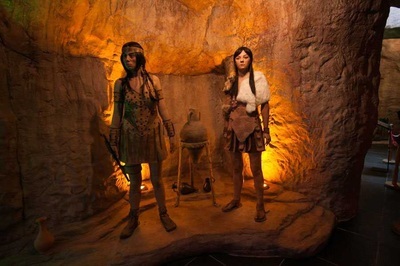 When you visit here, you’re suddenly immersed into the world of these fierce female warriors, with creepy life-like models representing the Amazons in a variety of daily activities. Those models’ eyes, leathers and tissues were made of silicon material and real human’s hair was used. Moreover, within that section, there are situated slaves in the prison. 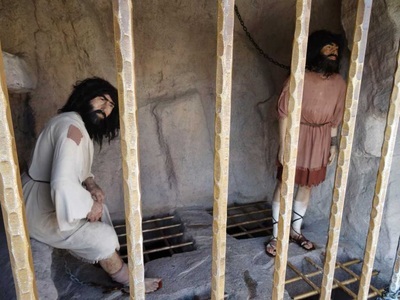 All slaves are exhibited as men, which shows that in that period, men were abused, manipulated by Amazon women. In contrast to the other stories like pirates coming, kidnapping the women and used their sexuality, Amazons used the men with the same aim. They come and sleep with the men in order to give birth a girl and to continue their bloodline. Except for that, figure of lion symbolises the power, rulership, dominance and courage. Therefore this miraculous model was used here to represent or identify how Amazon warriors are powerful, brave and fearless. Additionally, it looks like an object resembling Trojan Horse. 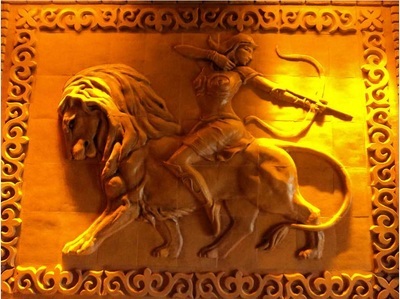 There are various legends about Amazons and their origins. One of them is emphasized in Samsun. It is believed that the origin of Amazons is figured out in Samsun, home of them. They lived here between 2000 and 1000 BC. It’s said that these Amazons fought under the command of Agamemnon in the Battle of Troy in 1200 BC, protecting Anatolia under the command of Queen Penthesileia (leader of Amazons), who was later killed by Achilles (hero of Iliad written by great historian Homer).Also it is considered that Amazons cut their right breast so that they can professionally shoot arrows.